This week we have released a patch with a bunch of important bug fixes and some tweaks based on your feedback. Skill raise bonus for the favorites of gods. Along with common sacrifices and activities players will be able to sacrifice experience to our gods. During the Archimankur and Makthrid elections, the top 100 player-favorites of each god will get an increased speed of XP to skill points conversion for the next day. Fief size increase. You will be able to spend certain amounts of precious metals in order to increase the size of your fief by 1 tile in all directions. If you upgrade two neighboring fiefs in this manner, that will effectively remove the neutral tiles line between them and will allow you to build the bigger towns and castles without being afraid that certain parts will decay! Military outpost. The only type of outpost that can be constructed on any distant fief. Slightly cheaper to construct and upgrade, though still will require a certain amount of effort. This outpost does not produce anything. Consider it to be the main guild vs guild offensive outpost. Overseer and slaves will act as archers and will attack any player that does not have “Can enter” access set on the fief. IB totem price lowered to 10 Gold Coins. In combination with a cheaper level 3 Military outpost, this should kick start the global wars for provinces. Centralized outpost support payments and God’s Coins can be used to pay the upkeep. You will be able to use God’s Coins to pay for your monument and outposts. Also, you will be able to open the interface on your Guild Monument that will show the list of all your guild outposts. This interface will allow you to pay for their support remotely. Significantly lowered support costs for all levels of monuments and outpost. To reduce the grinding pressure on our players. Inspired work booster. We’ve promised that settlers of Godenland will have the Pioneer amulet for a month. We are going to allow these amulets to remain with their owners, but the special effect of this amulet that allowed you to perform all activities 20% faster will be removed. We’re going to implement a premium shop booster that will temporarily provide the player with the same effect. Last but not the least… climbing mode and siege ladders! You will not be stuck in the bug/death pits, or high in the mountain pockets. The same climbing mode will allow you to use steep siege ladders to scale the walls! No more barkboxes and sleeping bags - but proper siege ladders and siege platforms! As many of you are well aware - we had a spur of the moment PvP AMA in our Discord a week ago about “barkboxing” into enemy castles outside of JH. The result of this AMA was a poll that was running for an about the week. We agree with the majority that it is good to have relative safety inside the perimeter of your walls outside of JH. We have also not forgotten the PVP hungry players and have a sweet treat for them too - new siege ladders should make it possible to get over palisade and stone walls EVEN if they’re placed on top of a heavily terraformed slope! That means that during JH almost all types of fortifications will be vulnerable to assaults using these siege ladders and the brave warriors that use them to get in and wreak havoc! 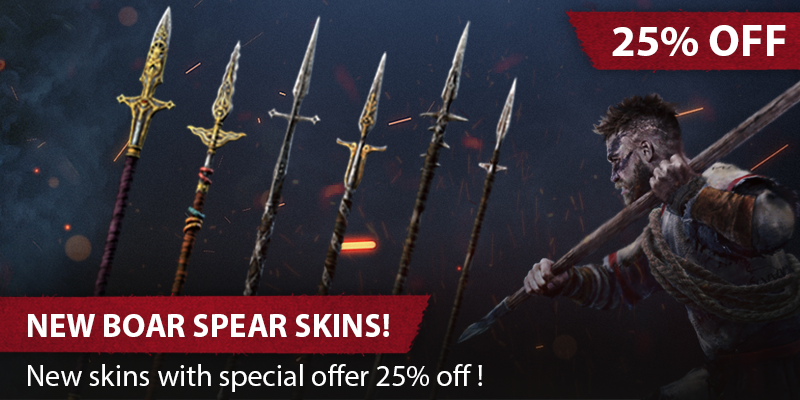 This weekend we’re introducing brand new Boar Spear skins in the store at 25% off. The Boar Spear is the heaviest of the spears, and it deals the biggest damage of them all. Due to its fine balancing, it also has a quick swing, which will benefit you on the battlefield, in the Arena or out in the wild on a hunt. It’s easy to build starting from level 30 Weaponsmithing, and now you can decorate it to your liking at a special price! Speaking of hunting and more - this week the Treasure hunt event is in full swing, and we were blessed to see so many of you participating and exploring the vast map for these chests. If for some reason you haven't joined the fun yet - don’t waste another second, and stay tuned to our Discord for instructions and hints! If you have any feedback on the Treasure Hunt event or suggestion about the future events, please message the LiF team about it!